Hi guys! Happy Tuesday! Wow, I went 6 day's without internet service and had serious doubts I was even going to get this post out to you, but low and behold...I made it...phew....! Anyhoo, my addiction with this stamp set does continue, but this card was actually conceptualized accidentally! What I mean is, when making one of the other cards, I had punched out the sweetheart shaped piece from a half sheet of cardstock sitting on my desk. Well that half sheet was still sitting there and so I picked it up and went a head and folded it in half again (creating a card base) and that's all she wrote...I got this idea, and here it is! Paper: Real Red 8 1/2" x 5 1/2" cut and scored 4 1/4" and scrap; Whisper White 5 1/4" x 4" and scrap for heart Sending Love DSP 2' x 5 1/4"
Punch the sweetheart shape from the bottom right corner of the card base and adhere the DSP to the left. Run a piece of scrap Real Red through the Big Shot with the 2nd largest heart framelit and a Whisper White piece with the next smaller size. Run the Real Red heart through again with the Falling Petals TIEF and adhere that to the card over the DSP. 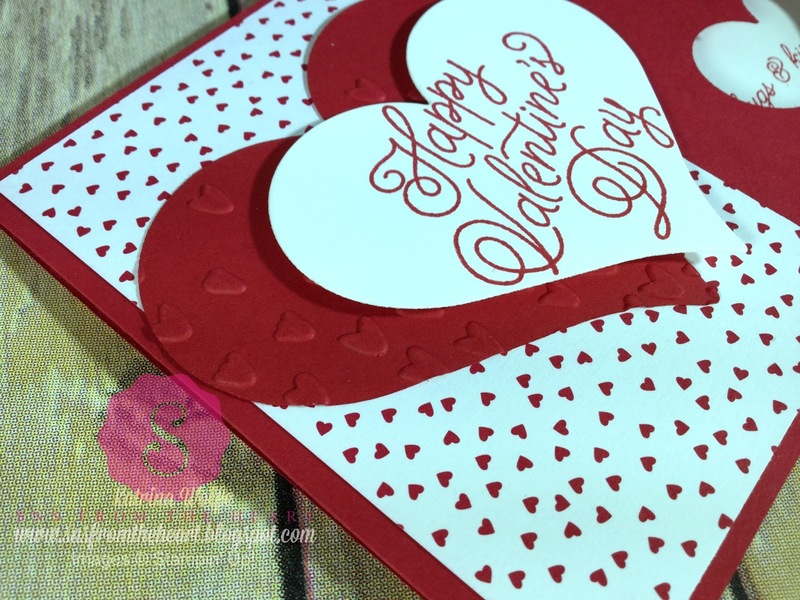 Stamp the Happy Valentine's Day in Real Red onto the Whisper White heart. and add that to the card with a Dimensional overlapping the Real Red heart. Add 3 small pearls to the bottom right. 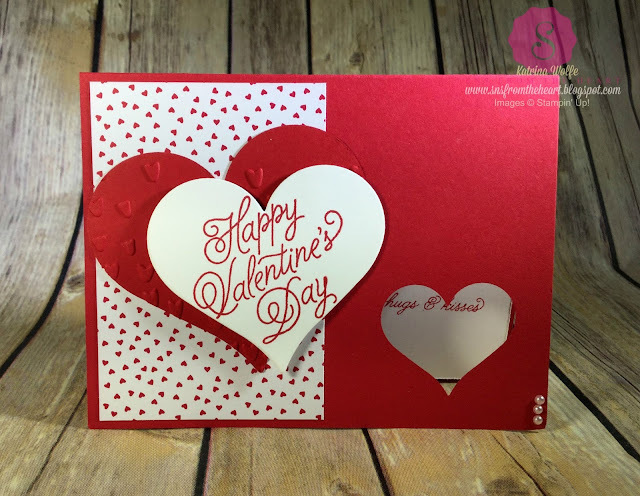 Add a piece of Whisper White to the inside of the card and while holding the card closed, stamp the Hugs and Kisses in the center of the punched heart. I hope you enjoyed today's "accidental" card. Please leave me a comment and let me know your thoughts. I would love to hear. Thank you and have a great day! Sale-a-Bration: Why You Should Join My Team Now!